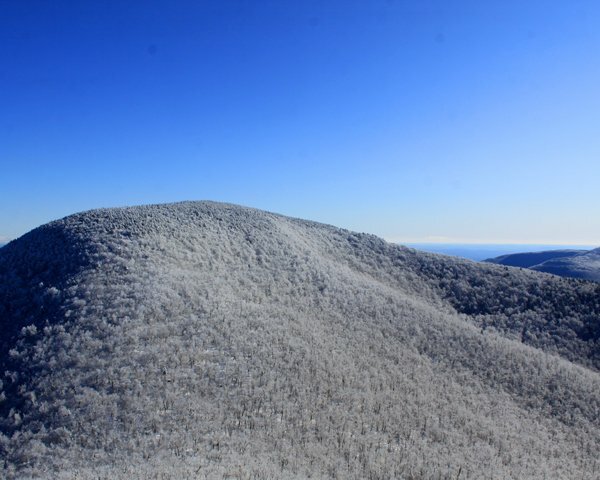 On 22 December a birder named David Rankin was hiking in the Catskill mountains of upstate New York when a fellow hiker asked him what the bird that just flew off the trail was. Fortunately David had a camera because it seems unlikely that anyone would have believed his report of a Gray-crowned Rosy-Finch, a bird that is very rarely found east of the Rocky Mountains, if he hadn’t managed to get a few pictures. 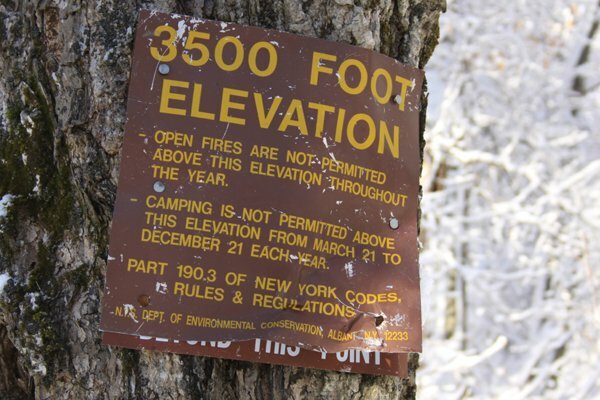 He spotted the bird at the summit of Black Dome Mountain, the third highest peak in the Catskills, and the report of such a rarity in New York* to the listserv set off a storm of emails. The images above and below are the Gray-crowned Rosy-Finch Leucosticte tephrocotis at Black Dome Mountain by David Rankin. They are used with permission. Because my parents’ house, where I was planning to spend the holidays, is only about forty minutes by car from the trailhead closest to the summit of Black Dome Mountain, I figured I was ideally positioned to make the attempt to refind the bird. This explains how I found myself in the cold, dark, snow-filled woods at the end of Big Hollow Road near Maplecrest, New York, at just before 7 AM on Christmas Eve. The day between the initial sighting and my being prepared for the hike had seen some snow dumped on the summit of Black Dome Mountain and the temperatures had taken a dip as well. My car’s temperature gauge read 18 degrees (-8 for those of you in Celsius-land) and once the cars carrying other intrepid birders pulled up we bundled up well and prepared for our foolhardy task. Our group consisted of me, Rich Fried, who has tied the New York State big year record of 350 species this year, his daughter, Lila Fried, Jacob Drucker, Ben Goloff, Arie Gilbert, and Tait Johansson. Rob Bate and his wife, Linda, were running a bit late and planned to join us on the summit. As we prepared for the hike we (or at least I) were giddy with excitement over the chance at seeing such a great bird for New York but we (again, at least I) were also a bit concerned about the trail conditions over the two-and-a-quarter miles and 1,750 feet in elevation gain that we were about to attempt. The trail started out with a mild incline through hemlocks along a burbling brook. A couple of Northern Ravens were croaking from the sky above us. There was very little snow at all and the hike was easy! We spished in small group of Black-capped Chickadees, a Brown Creeper, a Hairy Woodpecker, and a Downy Woodpecker. Despite the cold weather several of us took off one of our many layers of clothing as the hiking had really gotten our blood flowing. 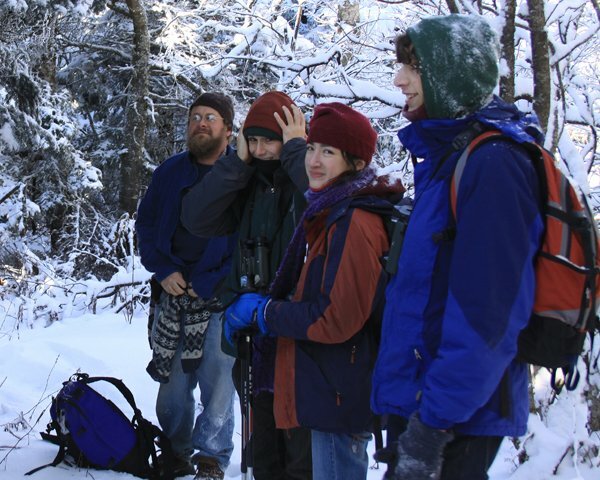 Then the trail started to climb and became very rocky and snow-covered and our crew of birders spread out further and further apart from each other. I forged on ahead, wanting to get the climbing done as quickly as possible, and was first to come to this cruel jape of a sign that some mean person had left behind for birders wishing for bird-song. 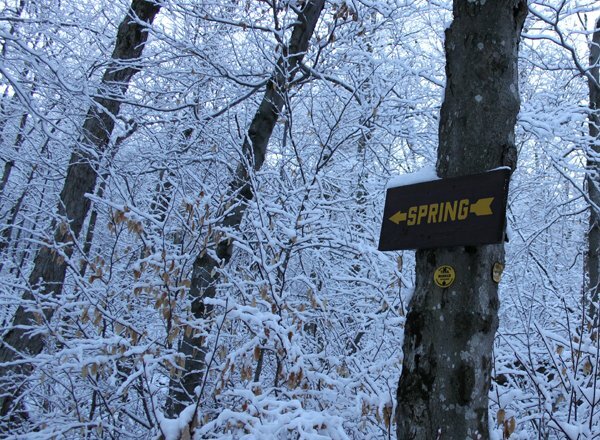 Eventually, the slope got steep enough that the trail became a series of switchbacks through the snow-covered forest. Occasional stops to get my breath back and listen for birds were rewarded with mostly silence, though once a small flock of American Goldfinches landed nearby. 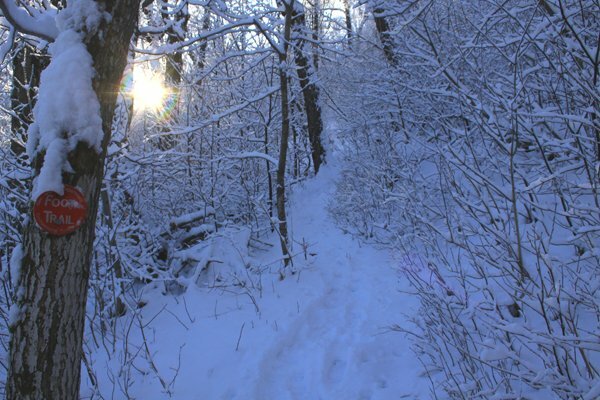 It was truly a winter wonderland and well worth the hike, rare bird or no! Because we were hiking south on a north-facing slope the sun took its time getting to us though as we climbed higher and higher the treetops became bathed in light and then, gradually, we reached levels where a bit of sun would reach us as well. After almost two hours of hiking I had reached the col between Black Dome Mountain and Blackhead Mountain and the trail junction that gave me the choice of hiking either mountain. Of course, I chose the former, but not before taking a breather and mentally preparing myself for the steep part of the hike. Getting from where I was to the summit of Black Dome Mountain would only be a hike of just over half-a-mile but with significant elevation gain. It was tough, and the steep trail with lots of snow forced me to use my hands and occasionally my knees to climb up. Exhausting work but well worth it when the summit was reached! It didn’t take too long for everyone else to reach the top but the only bird we found up there was a single American Robin feeding on Mountain Ash berries. We hiked back and forth on the trail across the summit, played tapes, and even put down some seed but the bird, our much desired rosy-finch, was nowhere to be found. I couldn’t stay too long, having left Daisy and Desi at my folks’ house, so I reluctantly bid my fellow birders farewell and started the hike back down, which actually became more of a slide for most of the way. *It is the first documented report of a Gray-crowned Rosy-Finch in New York though there is a generally not believed, single-observer, sight report from Rochester in January of 1923. A bad day birding is still a fabulous day out in nature. I think you just proved that! 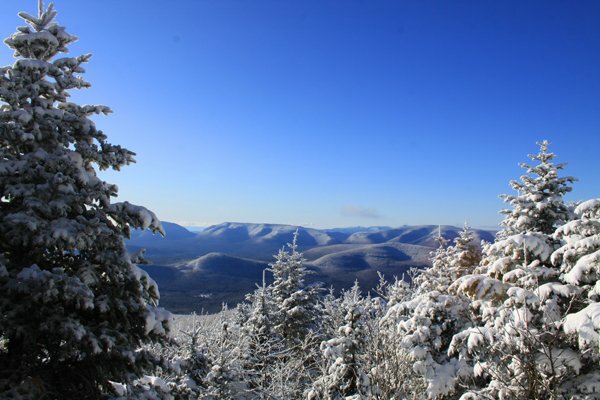 I suddenly want to visit the Catskills…in winter…which makes no sense. This stirring account belongs to the annals of mountaineering, right up there with Hillary and Norgay, Reinhold Messner, etc. All kidding aside, it sounds like an awesome hike. Hope the rosy-finch shows up again. One of your best posts ever dude. 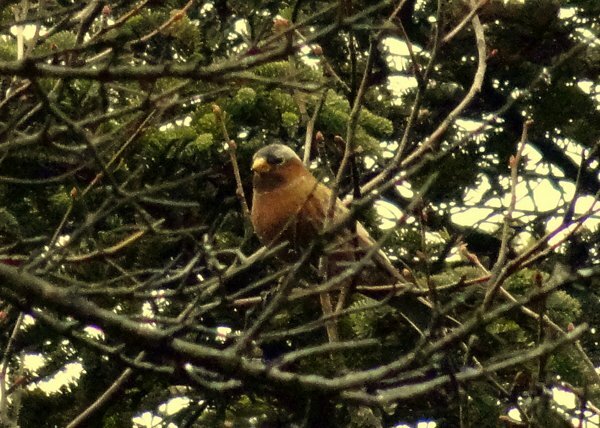 After such a tremendous hike and effort, you all managed to misidentify the finch as an “American Robin”? That’s hilarious! And also, everything the others have said so far.